Tonight ABC News is featuring an hour long prime time show defaming Jews. It’s something the network news division would NEVER do to Muslims. Well, tonight’s heavily promoted episode features stereotypically Jewish-looking actresses playing a daughter and a mother. The Jewish religion is invoked and the “daughter” tries to pay random men to pretend to be her fiance and imply that they’re converting to Judaism. The promos are filled with bigoted Jewish American Princess cliches. Because, hey, it’s open season on Jews. The show has also attacked Christians. But one group the show never attacks or portrays in a negative light are Muslims. Instead, the show has staged a scene in a bakery in which a “baker” (an actor) refuses to serve a “Muslim” (another actor) because “you’re terrorists.” Like that happens very often. And here’s a fact: as I’ve noted on this site many times, a high percentage of Muslims in America do believe acts of terrorism are justified against fellow Americans. That’s Pew Research saying that, not me. Funny, I never saw John Quinones send a guy in an Israeli flag t-shirt to a Muslim restaurant to see, “What Would They Do?” (not serve the guy or spit in his food). But Hispanics are never defamed the way Jews, Christians, conservatives, and right-wingers are on this joke of a “news” show. Neither are Muslims. Or Blacks. 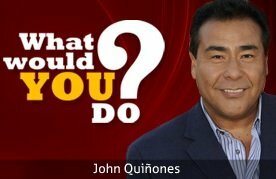 Where is the “What Would You Do?” episode featuring Muslims discussing honor-killing their daughters/sisters? Or the show featuring Muslims considering joining ISIS? Planning terrorist attacks? Where is the show with the Muslima bragging to her friends that she got “revirginization” surgery so her fiance wouldn’t know she’s not a virgin? These shows don’t exist because, while they do mirror everyday reality, they don’t match ABC News’ agenda. As George Orwell noted in “Animal Farm,” all of the animals in the barnyard are equal. But some are more equal than others. And for ABC News, Nazi-esque anti-Semitic propaganda parades as a news show about “morality.” So do attacks on Christians and conservatives. And you can extend this double standard to everything else on the network. What Would You Do? If you have any decency, you’ll change the channel. Permanently. Tags: ABC, ABC anti-Semitic, ABC Jews, ABC News, ABC News anti-Semitic, ABC News Jews, anti-Semitism, Jews, John Quinones, What Would You Do? ABC is the crappiest channel on the broadcast airwaves. And that’s saying something in a world where NBC exists. ABC News is owned by the Disney Corporation with diverse corporate ownership. The Disney family members are no longer the major stockholders of the Company. (All of the Disney members put together control less than the $7 billion plus controlled by Laurene Powell Jobs, Steve Jobs’ widow.) However, as has been the trend since Roy Disney, Walt’s brother, essentially led the Company, Jewish managers have been placed in top positions. Roy Disney died in 2009. This has been the practice not so much because the individuals are Jews, but rather, because Jews happen to have to be extraordinarily gifted in running show business enterprises. Don’t ask me why it is. It just is. 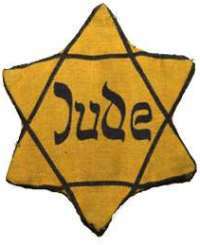 Just as I can’t explain to you why so many of the greatest violinists the world has ever known were/are Jews. Or if you made a list of the greatest Broadway musicals ever created, you’d be astounded by how many of them were written by Jews. This is not to say, of course, that being Jewish will make you successful in show business; nor am I saying that non-Jews can’t be great at show business, as many non-Jews obviously are. It’s one of those things that I don’t think is just a wild coincidence. Now with that out of the way, the CEO of Disney is Bob Iger and the chief of ABC News is James Goldston, and both, of course, are Jews. Although Debbie has a point about ABC, it’s also fair to point out that ABC takes plenty of hits from the anti-Israel crowd from what they assert is a pro-Israel stance. And of course, that same crowd is quick to attribute the cause of that to the Jewish managers I spoke of. Frankly, I don’t see evidence of a pro-Israel stance, but I pay less attention to ABC News these days. I would think ABC News is about as pro-Israel as the New York Times, which is far from it. So antisemitic ABC is controlled by Jews. No surprise. JINO’s would be a more appropriate term. Unfortunately, there are lot of self-hating Jews out there, many in the media and Hollywood. Surprising? Unbelievable? Sadly not. No reason to doubt Debbie’s take on tonight’s program is right on target. ABC’s–and fellow travelling networks’– capacity for distorting reality is exceeded only by the stupidity of people who still find them credible; it’s a way of life for them.Horrid odorous dreck is par for the course. But how unsporting of them to begin without shouting “FORRE”! What Would You Do? Read Debbie instead of watching TV. Embracing Diversity is the new default setting. “Anti-racist” is a nice euphemism for anti-white — unless, of course, the white is a Muslim. Diversity? Yep, as long as you’re not a rabid feminist who paradoxically hates Sarah Palin; or, if you’re queer and some Republican taps your foot in the bathroom stall. Morals are for us fools who fell into some PC trap set by people without scruples. And, yes, ABC that means you and that sinverguenza Quinones. ABC is absolutely the worst and should,without a doubt !! have their FCC license pulled !! They are a complete sham as is 90% of the major news market. There should be an investigation into the media, unfortunately Congress has no spine. There are elements in the entertainment and news world that are communists and traitors to America. They should be in prison along with the enabling spinefree politicians, which also has RED COMMUNISTS. Great article, Debbie, so true!! Thanks for reporting this to us! Keep up the great work, we need you to speak the truth!! So I heard this is the official website of the KKK?